I think this song embodies everything about the struggle of making art. Apparently, the song itself came from a place of frustration and writing the final track for the Born in the USA album. It’s pure beauty. Keep your eyes open. I won’t rehash it more than I already have, but there are trillions of people all around us, full of intrigue. Stare at them. (Carefully. A newspaper or book helps if you need to look away quickly.) Watch them. Imagine. Write. Read. Good writers being good readers aside, I think it’s important to also surround yourself with everything from newspapers to small ads in the back of magazines. You never know when a story will jump out at you. Know the Difference…between laziness and being blocked. Because I gets lazy. The work is there, the ideas are there, but there’s a Golden Girls marathon on, and I don’t feel like writing…you get my drift. The marked difference, I think, is how you feel. I’ve been in a place where I could not write. Nothing helped; creativity was next to gone; I even shed tears about it. It was weird, crippling, and utterly frustrating, being that for most of my life, writing is all I’ve done.. Conversely, I once peered through some of the pieces I was working on and bypassed all of that for a nap on the couch and some channel surfing. Yep. Major difference. Art. You see them when you visit the museum or art galleries. They sit on benches facing paintings/sculptures/etc., staring intently at the works of art as they write/sketch/doodle into notebooks and tablets. In my mind, some of them have come to get the creative juices flowing. And I’d like to think that art inspiring art is the way to do it. Those Pesky Delusions of Grandeur. Ok. Perhaps like me, you think every piece of fiction you create should be the next winner of the O. Henry Award for Fiction? So you’re waiting for an elevated, complex plot that trumps the so-called simple idea you have in your head about a dog who finds a pot of gold in the backyward? Yes? I once had a college pal and fellow writer (amazing, that guy) tell me, after I complained about writer’s block, “I don’t believe you. The ideas are there. You just don’t like them.” At the time, I wanted to kick him in the toes. Deep down, perhaps he was right. Well, not perhaps; he was correct, being that I had just mentioned a few ideas playing around in my head. The point is–and I constantly deal with this–work with what you have. An idea is an idea. It may not be the next piece shortlisted for the Orange Prize for Fiction (oh, I know ALL the awards for fiction, believe me), but it’s all yours. Work with it. Six ideas, not 15, but I think you get where I’m going with this. It’s really advice to myself: just try to keep writing. Anyone out there have tips to combat writer’s block? Welcome? Not really, because I doubt that many eyes will visit this little nook within the web world. Anyway, that’s not entirely a concern–I’m doing this as a form of self-discipline. You see, I’m a “writer.” (Get used to the quotes.) But I hardly write anymore. Therefore, in an effort to somehow keep at it, this is a little exercise to keep what’s left of my creative brain–largely burned to a crisp after years of technical writing and utter boredom–going. So I Don’t Forget: forget my love of words, of prose, of putting it all together. 1) Write something every day. 2) Don’t be frustrated when what you produce isn’t worthy of an A+ sticker, much less a Pulitzer or The New Yorker (applicable for times when I feel like sharing my work). 3) Yeah, about Promise #2: be realistic. You’re not going to win a Pulitzer next month. The chances that you’ll make it to the New Yorker are, well, currently slim. 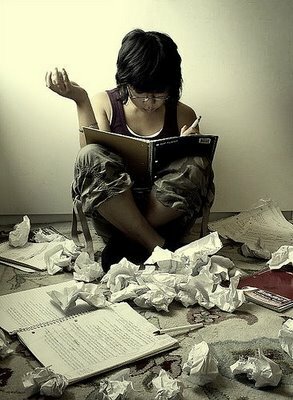 (One day, one day…) Right now, re-develop your love for writing; work on the craft, then think about those other things. 4) Seriously, Girley, write EVERY DAY. And so, I’m going to express myself in the ways I know how (journaling, thinking aloud, getting my thoughts out there) and in a few other ways (mild ranting and raving, presenting my work every once in a while). Let’s hope this thing works.